Did IBM sell the "IBM" PC-name with it's PC biz to the Chinese or can IBM still sell specialized Macs as "IBM's" if they (IBM & Apple) wanted? IBM has to wait 5 years to do anything with selling or promoting macs if they wanted to. IBM is the name of the company, not a line of PCs. Selling off the PC line in no way prevents them from using the IBM name for anything they want. That would be silly. As pointed out though, their contract prevents them from re-entering the PC market for 5 years. >>>IBM is the name of the company, not a line of PCs. Selling off the PC line in no way prevents them from using the IBM name for anything they want. That would be silly. All IBM PC's and laptops still have the IBM logo on them as we speak right? So will the Chinese still use the "IBM" logo on PC's and laptops they produce until they get people adjusted to the new name and after that has been completed IBM can re-enter the PC and laptop market with the "IBM" brand if they wanted? IBM isn't the name of the laptops, for instance. ThinkPad is. And I wouldn't imagine Legovo (which still sounds like a Tolkien character to me) would use that name anyway. Yes, for 5 years Lenovo gets to use the IBM name and logo on the PC and laptop lines. Convincing folks they are still IBM's may take a bit though. 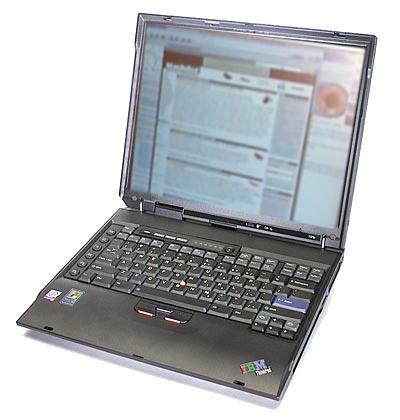 It looks like all the images I found on google regarding IBM's Thinkpads all had IBM's logo on them as well. Don't forget that IBM purchased a stake in Lenovo as part of this deal. When IBM spun-off fits printer/typewriter division into Lexmark, the names of the existing products did not change. More than 10 years ago, my office purchased an IBM Wheelwriter by Lexmark automatic typewriter with the IBM logo. On a trip to Office Depot this afternoon, you are likely to see an IBM Wheelwriter by Lexmark with the IBM logo. Lexmark sells office equipment under its own name, but IBM's name is still more respected. With the names IBM PC and IBM Thinkpad, Lenovo's purchases would mean about as much as Acer or Packard-Bell. You can be assured that Lenovo will use the IBM name for years to come. And Ford's all have Ford on them. If they sold the Focus rights to BMW, they would have BMW logos on them.
" ... can IBM sell Macs as IBM's?" Well I wouldn't see why they'd want to. They are free to sell Macs as Macs. "Lenovo will be the preferred supplier of PCs to IBM and will be allowed to use the IBM brand for five years under an agreement that includes the "Think" brand." I don't see this in any way stopping IBM from selling and even, in some cases, recommending Apple products to it's enterprise customers. Adding Apple products, both hardware and software, to it's service and support structure would be a gain in revenue for IBM. Revenue in the area IBM is most aggressively pursuing. Then there is the "Power everywhere" plan to take on the Wintel cabal's lock on the desktop and (in the case of Intel) the low end server market. Apple, as the primer vendor of computers powered by the IBM 970 ie G5 needs to be a success story for IBM to gain any traction as a chip supplier for desktop systems. The fact that Apple can run MS Office makes it appealing for many of IBM's enterprise customers, who can do quite well without XP, but must have Office as their main productivity application, regardless of platform. Sure, IBM is pushing Linux and it's own productivity applications (Notes etc...) but it still wants to sell whatever the customer is buying. If they must have Microsoft Office why not give it to them on Macs? The service and support contracts will bring in the same (or more) revenue as with a Lenovo/IBM desktop system. The ultimate partnership for Apple and IBM would be to license OSX to IBM for use on desktops and servers. This would leave Apple the consumer and small business market, while generating millions and possibly billions, over time, in licensing fees from IBM's enterprise accounts. Microsoft has shown it's hand regarding how it plans to deal with Linux, so even if the coming court battles over the use of Linux are a stalemate for the next few years, having another option must seem appealing to IBM. Not if the sales contract also specified specific methods and limitations on how long BMW could use the Ford logo for that particular product. Which is exactly what Lenovo got from IBM. Actually the comparison would be more relevant if it was Ford buying the cachet of the BMW 3 Series lock stock and barrel, then getting to use the BMW name for 5 years even though they would no longer be produced or sold by BMW. Weird, but the lawyers got this one through because who would want to buy a Lenovo ThinkPad today??? There needs to be a brand transition period or the deal would be plain stupid. Thanks for the details of the contract regarding name use, I wasn't aware of that being the specific case here. *In general*, companies sell off their manufacturing capabilities, support, etc, in anticipation that the buyer will make their own brand, advertising, and customer base.
. . . *In general*, companies sell off their manufacturing capabilities, support, etc, in anticipation that the buyer will make their own brand, advertising, and customer base. It may not be that rare to transition a brand name when the selling company is well known and the buyer is more obscure. My phone company stopped making their own directory and yellow pages, and the books went through such a transition. Last year the books had the phone company's name followed by the directory company's name, equal size font. This year the books just show the directory company's name, and in smaller font mentions the phone company. I donno if it was mentioned (I don't have time to read up either), but IBM's deal was to not sell ANY PCs until like 2007 or something. I don't know if it applies to Apple workstations or not, but it certainly seems like this rumor has been quashed. I tend to agree with your thoughts. I think this would be a commanding and profitable arrangement if it ever become reality. This would serve to benefit the everyday Mac users. Maybe finally our platform will become a dominant player at the expense of M$. I hope they swing into action before Longhorn ships. I too tend to agree with the ideas presented. Apple has an OS that runs MS Office on PPC hardware. Yet, there is the clause that prevents IBM from "selling or manufacturing" desktop and laptop computers, except for Lenovo's, for five years. It may be possible for IBM to offer service and financing on Macs purchased from Apple until then, however. Also, Apple needs to offer models of the Mac that are more in line with what IBM business customers want. That alone may take five years. "IBM looks to be keeping more than it is giving up" in the Lenovo deal, says S&P computer-hardware equity analyst Megan Graham-Hackett. The PCs will still be sold with the IBM brand name, and Lenovo will pay IBM fees for warranties and technical support. In addition, IBM will provide financing to PC customers, and IBM's salespeople will be able to pitch Lenovo's PCs as well as other brands to their corporate clients. Note that IBM has kept support and service, as well as financing on the computers that Lenovo produces. They could easily do the same for Apple products. Heck, even CompUSA offers their own warrantee program (TAP) on Apple products right alongside AppleCare. The clause that prevents IBM from "selling or manufacturing" desktop and laptop computers, except for Lenovo's, refers to their own IBM brands, the name of which, is what Lenovo paid the 1.8 Billion for. What that means is that IBM cannot sell or manufacture a "ThinkPad" but they could sell a "PowerBook". They could easily do the same for Apple products. Heck, even CompUSA offers their own warrantee program (TAP) on Apple products right alongside AppleCare. You made my day, thanks for the info.